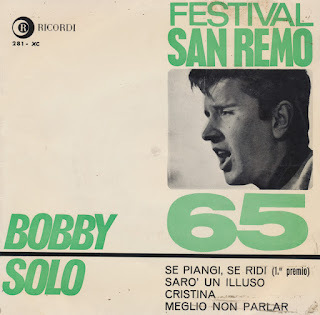 Bobby Solo was born as Roberto Satti in Rome on March 18, 1945. At 19 he participated in the San Remo music festival, but he was disqualified for using playback, which was contrary to the festival's regulations. The next year, 1965, he participated again... and won with the song 'Se piangi, se ridi'. As was tradition, the song went on to represent Italy in the Eurovision Song Contest that year. Bobby ended up in fifth place. This EP features four songs, but of course 'Se piangi, se ridi' is the first track on it.